What trust the weather models! Home / News / What trust the weather models! 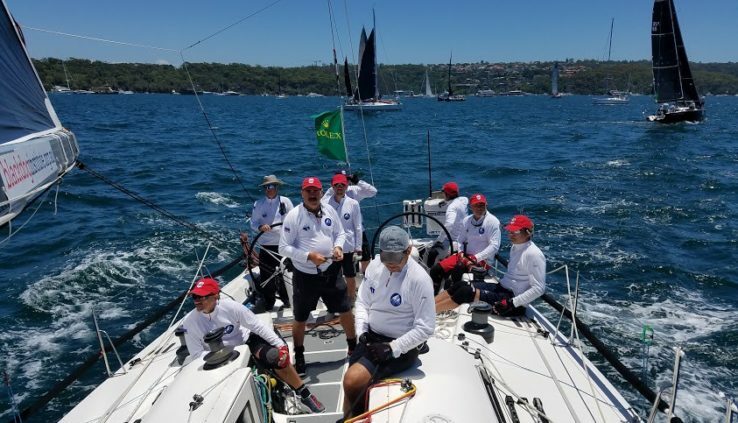 How was the famous race Rolex Sydney Hobart Yacht Race for the crew of the yacht under the Russian flag – SeaVentus Mahligai (Sydney 46), tell the organizer the participation of the Russian team Alexander Vodovatov and Anton Titorenko. © Alexey Gumenny and Oleg Nikolaychuk. Completed another successful project of the Russian club offshore racing “SeaVentus” (Russian Offshore Racing Club “SeaVentus”). Note that this was already the third one organized by the project to attract a fully-Russian team to participate in the Rolex Sydney Hobart. Now the regatta is over, the emotions subsided and it’s time to analyze the results and put all the memories “on the shelves”. To begin with, that this time (as always) “Sydney-Hobart” showed its weather unpredictability. Traditional weather briefing for skippers and navigators had not promised no surprises. A few weather models, demonstrated by the experts of the weather service of the Navy of Australia, promised quite a comfortable wind and wave conditions throughout the race. Anyway, during those three or three and a half days that we planned to get to the finish line, all weather model promised a moderate tail wind 10 to 20 knots with gusts to 25 and almost passing the same wave 1-2 m And only one of the models talked about the fact that just before Hobart, on the South-Eastern corner of Tasmania by 30 December may play a significant storm with high winds. But we, like the vast majority of crews planned at this time is to cross the finish line. Based on these inhibitory projections we built their tactics for the next race. Well, not true anything, except, perhaps, the direction of the wind. Only nature decided to match the predictions. But, everything in order. Before the start the team came to bless the father of Nikita were offered hospitality by FR – rector of the Church of St. Nicholas in Fairfield. Of course, from the aid of St. Nicholas, the patron Saint of travelers, before going out to sea no one will refuse. Saint Nicholas always helps! Start in Sydney harbour — the event itself is not very simple. In addition to the 85 new boats, quite small aquatic areas at the same time there are several dozen judicial ships and boats safety, water police, boat with journalists and photographers, plus regular ferry, which has not been canceled. In General, the flea market is such that often the cannot be seen signs, denoting the starting line. Here it is necessary to monitor not both, and in all 24 eyes. The crew as much as possible to be focused, otherwise trouble is inevitable. In this difficult situation, as always, did a fantastic job our captain and helmsman Vladimir Chirkov. No wonder Volodya is called master start. Rare case when he is in a seemingly hopeless situation in some incredible way, would not find no one visible “gap” and “millimetre” between teams that are not brought to the boat on the start line on one of the best positions. So this time we crossed the start just a second after the shot of a gun, almost on a par with a much larger opponent, who ten seconds before unceremoniously tried to drive us off the starting line and grab the most advantageous position. And after the first turn we were clearly ahead of the fleet, taking with us the start of the third starting line. (“Sydney-Hobart” traditionally employ three starting line for a distance of 200 meters one after another, to little to distribute the fleet in the waters. To align the total distance of the race at the exit from Sydney harbour to the ocean put three “take-down” of the sign at different distances from shore for each of the start groups.). So the following sign, which was actually started our direct route to Hobart, we not only broke away from “his”, but was overtaken a large part of the fleet off the line ahead of us. Then began the ocean stage, “Sydney-Hobart” with all its weather “surprises.” To begin the promised 10-15-node passing breeze was 20-25-node. And meter wave that promised all predictive models, imperceptibly, but quickly turned into a 2-meter. Of course, such weather conditions were not frightened, but a “small” inconsistency of wind speed and excitement you would expect a little alarmed. Oh, you had to listen to the officer weather service briefing, when he mentioned in passing that in these places, in these latitudes the wind in the squalls is not the usual 20-25%, and in most cases reach 40% and more. We consider it, who knows how much more successful would be our result. Meanwhile, we the little and “heavy” Spinnaker, driven by the passing wave, and 25-node wind, went to his first in this race night. Our A-4 was designed for maximum wind strength of 30 knots. And, guided by the tactics, built on the forecast, we were hoping most of the night to bear this small Spinnaker. Just in case preparing to fast setting A-3, substantially lighter and larger. Again, guided by a forecast for weakening of the wind. Not all the crews, even with considerable experience of racing in these waters, dare the night to carry spinnakers. In the dark when there’s no waves, do not see how the sail, and even in a strong wind, this activity is very dangerous. But we decided to resort to the tried-and-tested in the last race tactics when the team is absolutely focused and concentrated on the most precise control of the boat at night or in heavy weather. In past races such tactics are clearly justified. If the day, in daylight, we were able to win back from rivals a couple of places, the night passed on 15-20 boats. Decided to do the same this time. But the weather had other plans and our forecasts, it is not read. Unexpected (just 10-15 seconds), increase of wind up to 35-37 knots, poorly came at this moment a wave, a loud crash of tearing fabric and… we saw the sky in the place where they were supposed to be our A-4. The sky chaotically tossed the tattered rags and strips of skinoren. Our first Abraham went surprisingly smoothly. Scraps of Spinnaker, fortunately, easily succumbed cleaning, and the halyard and braces do not get confused and not hopelessly stuck somewhere out of reach. Quickly been given a “code zero”, and we carried on, although, unfortunately, could not go as fully as planned. Thus arose the first amendment developed tactical scheme. In addition, we quickly realized that the wind is not only not going to return to predicted values, but sometimes even increases a little and goes in. In General, it soon had minute and A-0, replacing it with a Jib-Top. And to go even a little sharper plan. But globally we still continued to perform the original tactical problem. With the dawn it became clear that such a dirty trick the weather wasn’t expecting many people, including very experienced crews. Stated in our division (PHS) 100-vucovic Scallywag from Hong Kong, catching a powerful gust and vitkovici nose in a wave, broke the bowsprit and was forced to go the distance. And, incidentally, the team on this boat, was the winner of the stage is Australian (Melbourne-Hong Kong) and took second place on another stage of the famous race of the Volvo Ocean Race-2017/18. So the rivals in our division have gotten very experienced, knowing these waters, and ocean races are not the movies. Not “couch skippers”! Another 54-foot boat Calypso was damaged steering and also left the race. There were losses in other divisions. Hungarian team (boat “M3”) ТР52 broke the mast, a couple of boats dropped out of the race damaging the rudder blades. In total, at one time or another because of various serious breakdowns, dropped out of the race six crews. In General, this race was just a supplier of weather surprises. Nobody expected such a trick from the oceans. The wind was off and on, as if by a magic wand. If someone was playing with a giant switch. A good 20-knots of wind just a few seconds gave way to a full (really full!) calm. In this case, the wave is, of course, remained. This lull could last 10-15 minutes, but could an hour and a half! And then, suddenly, in those same few seconds the wind rose to 20 knots still. And then could in just a few seconds to grow more nodes 10. For this race we have many times changed the sails as, probably, all previous offshore race our club put together. And there were already a lot! Often we changed sails several times per shift. Exhausted scary! Especially our tank. And if other team members could afford a “luxury” to change into something dry, the tank soaked through everything in the first watch and came to the finish line soaking wet. Not saved even heat “blanket” is covered in heat reflective Mylar foil wrap used by rescuers and climbers under which they were trying to keep warm in the rare breaks. A little added strength is that the guarana extract, combined with one of the team members. Rush jobs for the shift of the sails were so frequent that in one of those moments we missed a test session, for which he received a fine in 30 minutes. For skipping a single session is penalty per hour. We were given 30 minutes only because we woke up still in “reasonable” time is 15 minutes later than it should be. Luckily for us, the organizing Committee was there, and we late not considered absence from the relationship, and therefore reduced the fine. Here in this mode and passed the first two stages of the race along Australia to Cape Verde and across Bass Strait. As we wrote before, in my first material, seeing Tasmania, many believe that is already almost finished and relax. Tasmania does not forgive! We cannot relax until the final whistle. So this time, when to turn in Storm Bay and the mouth of the river Derwent remained 70-80 miles, we walked the full course, it seems under A-2, with wind of about 20 knots. The wind began to change a little bit, and we decided to change the Spinnaker to zero. But changing, after a few minutes realized that we have to go to the tacking. Strange dark band on the water away at the rate made us wary and to take, as it turned out, the only right decision — to put from the small and rugged staysail J-4. And then came the wind! Almost instantly blew up to 30 knots and a cross wave (which is still about 20 minutes ago was not in sight) began to significantly interfere with the smooth course of the boat, rising higher and higher. An hour later it became clear that the need to take the first reef. After another half hour the second. After another hour, when the wind is steadily blowing 40-45 knots and the waves rose up to three meters (and sometimes up and nearly 5 metre long “elephants”), it’s time for the third reef. As it turned out, worked most unlikely (one in four) of weather models. And it worked for a day before! It was decided that at the helm stand the most experienced tail — Vladimir Chirkov and Owen Murray (Murrey Owen). So they taxied one after another without any watches in the morning until the finish. And one of us all this time stretch — 11 a.m. to 2 a.m. worked on the grotto-the sheets, helping the steering. But everyone else had wasn’t sweet. Soaked to the bone and frozen to the bone, regardless of the time the ocean wearing waterproof suits! No one went to relax in the cabin, all remained on Board, otkrenivat the boat as much and getting a 15 second cold shower of the dozens of gallons of water flying at you like a water cannon, from the next wave. Especially given those who were seated closer to the rigging and took the charges on himself first, covering comrades. And flew with such force that it could sit only with his back turned to this natural hose. For a long time there has not been sustained. So otkryvaya also had its rotation, as even this work was not easy. At one point we heard a warning shout Murray: “Wave!!!”. And in a moment the boat was struck , probably a ton of water. And the boat shook so that the steering and main trimmer, who at this moment ran to the stern to knock out the backstay, flipped on the meter! If at this point one is firmly holding the steering wheel, and the second the handle of the winch, simply had to start working out procedure of the MOU. The first time ever (and we’ve been with him for three of the “Sydney Hobart”), we saw shivering in the cold of the Murray, when he went to change on the wheel of Vladimir Chirkov, after sat adrenopause in the first position for a couple of hours. But no wonder the old-timers say that it is often a race “Sydney-Hobart” only begins at the mouth of the Derwent! Once again the weather surprised us with an unexpected surprise. At the mouth not only quickly subsided wave, but absolutely “off” in the wind! AB-so-fierce-but! This one could not even imagine: some twenty minutes ago we pressed a 45-node wind and 3-4 metre high wave, and now we were surrounded by “a complete zero”, both by water and by air. At some point we are under the influence of currents even moved back, out of the mouth of the ocean, in Storm Bay. Were ready to drop anchor in order not to lose distance to the finish line! Fortunately, the coastal breeze, gaining a couple of knots forces stopped our drift from the finish line. And after almost an hour, finally able to move us in the right direction. So we tacked. Under the staysail, the Spinnaker, then the “zero” and, through skilful steering of Vladimir was approaching the finish line. And then the wind gave us another surprise — 10 seconds (traditionally for the race this year) has risen from 3-4 to 13-14 knots-ish, and we just flew the last few miles to the finish line. All so tired that elation of forces practically does not remain. While the rising breeze played into the hands of some of our rivals. While we were stood in absolute calm, they came to us, reducing the gap. Steady-state and steady breezes not only took us in to the finish, but also rivals. As a result of the recalculation on the basis of handicaps, we were only on the seventh position, losing his closest pursuers from 18 to 30 minutes. And that’s despite the fact that he had received a 30 minute penalty for missing a session. Whatever it was, all laid out so that it is not disappointed not a very high result. Of course, we hoped for more – after two previous “Hobart” we have shown the first and second results. Even set a record speed of course for his division. But this year, it’s safe to say that worked the Olympic principle, formulated by Pierre de Coubertin: the important is not to win but it’s HOW you participated. Most importantly, what did you do to win EVERYTHING I could. Our team really did what I could. To the fullest. Just at this time, the opponents were a little luckier, a little more prepared. Let us wait next time! Russian club offshore racing “SeaVentus” thanks all participants of this complex and dramatic race for the dedication and absolute commitment: watch Vladimir Chirkov Alexander Sarychev, Alexander Koltsov, Alexander Vodovatov; watch Murray Owen Gazarov Artyom, and Oleg Nikolaychuk, Vladimir of Oderov; watch Anton Titorenko — Alexey gumenny, Anatoly Teplyakov, Igor Sukhov. Nobody shirked and not “sick”, but rather always on the first call, not paying attention to the schedule of watches and tiredness, just went and done my job. And often also covered for each other in difficult minute, which was a lot! New 2019 provides opportunities for new projects , we invite you fans of offshore racing, will join our team! Calendar new regattas will be published on the Club page offshore racing “SeaVentus” in Facebook, we expect such udivitelnye regatta like the Rolex Fastnet Race 2019 , as well as a new project in Asia – Hong-Kong Puerto Galera Race 2019 ( Hong Kong-Philippines). Humenne pictures of Alexei and Oleg Nikolaychuk.